New alleged details surrounding the death of Andrea Greenberg and the recent apparent suicide of her ex-boyfriend are being unveiled by Greenberg’s sister and former friends of the couple. Alejandro Aparicio died earlier this month in an apparent suicide after he rammed his motorcycle head-on into an 18-wheel truck in the Everglades. He was facing charges of grand theft, organized fraud and forgery for allegedly submitting a forged will, which would have made him the sole beneficiary and executor of Greenberg’s $1 million estate. Greenberg, a top real estate marketing executive in Miami, died in her Morningside home in October 2017. Her sister, Valerie Greenberg, is now speaking out about the circumstances surrounding her death. Valerie told the Miami Herald that forensic analysis showed Andrea had Googled “poison symptoms” on her iPad a couple of hours before her death. Valerie is also alleging that Aparicio forged loans secured by Andrea’s home and stole money from her in other ways. Aparicio also said in a Facebook post that Andrea’s death was caused by “unknowingly opioid-laced diet pills manufactured in a Chinese pharmaceutical laboratory,” but never gave the remaining pills to the police. And the medication he told police she was taking, phentermine hydrochloride, has not been tied to any opioid deaths, the Herald reported. People who knew Aparicio spoke of his deceptive tactics. 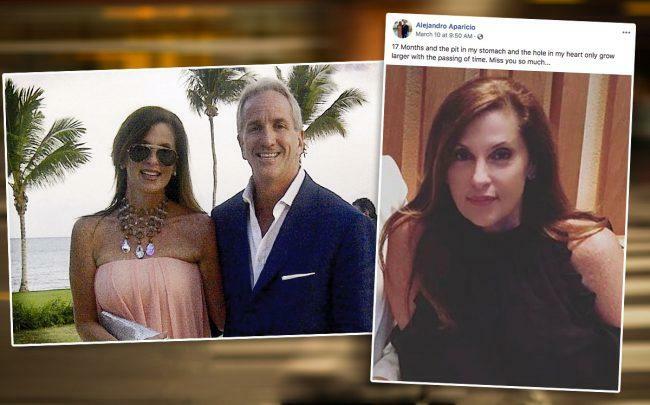 Miami real estate agent Lucrecia Lindemann, who years ago dated Aparicio on and off for a year-and-a-half, told the newspaper that he was a “Don Juan.” She resigned from Fortune, where Andrea Greenberg and Aparicio met, and later ended her relationship with Aparicio when she found out that he was still with Andrea.